After earning his economics degree at Gonzaga University, Austen worked for Colliers International, a real estate services company. Austen currently attends The Art Institute of Seattle studying animation and pursuing his life-long interest in music and art. 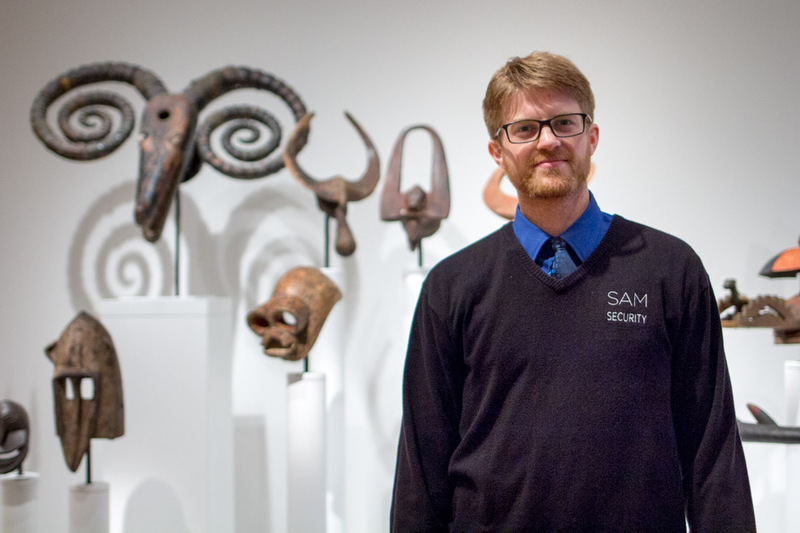 Working at SAM surrounded by artwork and conversations with coworkers and museum patrons provides him constant inspiration. SAM: Yves Saint Laurent: The Perfection of Style opened on October 11. What’s your favorite part of the exhibition? Mumper: Seeing the life of a fashion designer and the process that goes into clothing design is a very new perspective for me. The rooms alone are beautifully arranged, completely unrecognizable from past exhibitions I’ve worked. Still owning hand-me-downs, I don’t think people should be taking my fashion advice, but any person interested in fashion must see this show. Choosing a favorite piece is incredibly difficult. That said, the section I frequent most is the African Art—in particular, Standing Figure (Nkondi), a religious idol made by the Kongo people. Each nail driven into this figure represents an oath between two people. If that oath is broken, the spirit of this vessel will travel out from its base to harm any violators in play. It’s amazing to have something made by a community to help everyone displayed for everyone to see. My favorite artist is Hayao Miyazaki, a Japanese film director, producer, screenwriter, animator, author, and manga artist. Miyazaki’s goal was to build a studio where the priority was not success, but making good films. The depth of his characters is amazing, it’s like we know them by the end of the film. His fictional worlds use his personal experience, historical facts, and his opinions to tell you how he sees reality and what he has learned form it. Miyazaki said, “Creating animation means creating a fictional world. That world soothes the spirit of those who are disheartened and exhausted from dealing with the sharp edges of reality.” I keep this in mind each step of the way towards my goals in animation. I encourage anyone to ask questions or simply share with us. We all have unique insights that can benefit both speaker and listener, although taking your time to experience the art is understandable. I appreciate all of the people I’ve learned from, and I enjoy when I can talk about the art with someone who enjoys it as much as myself and the rest of the people working at the SAM. Most of my time is taken up with work and classes, both of which I enjoy. Working at SAM has been its own education—learning about people, places and pieces all telling great stories. I couldn’t have asked for a better position in my attempts to join the art community.